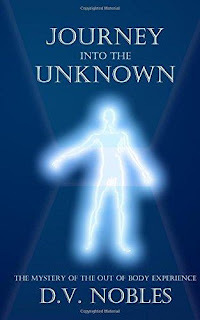 Today I'm reviewing the book Journey Into the Unknown: The Mystery of the Out of Body Experience by D.V. Nobles. The fact that Nobles had his first real OBE when he was 48 should be encouraging to older people (like me!) who may think OBEs get harder as you get old. Don't forget: Robert Monroe had his first OBEs after he retired. I disagree with Nobles and side with the consensus, but it's not just a matter of conjecture for me: I've personally seen it. Many times I've "woken up" in the middle of the night, or during a dream, only to find myself floating above my physical body. Maybe it's not enough to say we do it "every night" but it sure seems like "business as usual" to me when it happens. "Will I encounter angels, demons or other spiritual entities? Well, I guess I haven't encountered "angels" or "demons" either, but perhaps it's a matter of interpretation. I have encountered "angelic entities," ones that seem to be "guides," and of course the invisible helpers, who I think are probably what many would call angels. None of them had wings. I've (rarely) seen hideous looking creatures that seemed to be malign, but I don't tend to label them as demons. I think it's all about your belief system and the label you want to apply: one man's demon is another man's Djinn, if you know what I mean. And as for "other spiritual entities" there are plenty of those. I tend to think Nobles just needs a few more years of experience. Maybe we'll read about them in a sequel. "How long does an OBE last? Again, this might be a matter of experience. The 45 to 50 minute prep time is about what it takes me too (although sometimes, rarely, I've popped out right away). While most of my OBEs are quite short, I'd estimate the longest I've been out was about two and a half hours. He presents some discussion on why he had such problems. It was interesting, but not as insightful as the discussion in Frederick Aardema's book Explorations In Consciousness, which I think is the gold standard. "Normal thought pattern: Oh, the car is low on gas. I need to stop by the gas station next time I go out. Gas is getting so expensive now. I have to check my bank account to see if I have enough money for the light bill. I wonder if I should change my lights to those new eco-friendly bulbs that..."
It takes time and experience to stop your thoughts completely for any length of time, but this processing of learning to derail the train of thought is a valuable step toward that. Very insightful. All of these techniques are meant to be preceded by a set of 14 preparation steps, like healthy eating and sleeping habits, lying still, relaxation, breathing normally, and so forth. They're all pretty basic techniques. This is a medium-short book: 88 pages long, with a smallish font and small margins, which means there's a decent amount of content. It's not a long read, but I did not feel shortchanged either. The writing is mature, but not highly polished. There were only a couple things that annoyed me as a Grammar Nazi: (1) he used the possessive form "OBE's" where he meant the plural "OBEs" and (2) he misspelled the word hypnagogic as "hypnogogic." (I think I screwed that up in my first book too; which may explain why I became a grammar Nazi.) Other than that, there were very few mistakes. I give this book a thumbs up. It has a level-headed approach to the topic (neither too skeptical, nor too gullible). It has the thrill and excitement of discovery, but only one or two OBE narratives. It's not as long or as good as the first books by Robert Monroe, William Buhlman, Sylvan Muldoon, Daryl Berry, Frederick Aardema, and others, but I did enjoy it.